Not to be confused with Ytterbium (Yb) or Erbium (Er). 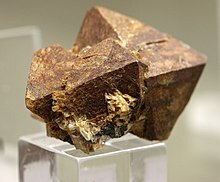 Naturally occurring terbium is composed of its only stable isotope, terbium-159; the element is thus called mononuclidic and monoisotopic. Thirty-six radioisotopes have been characterized, with the heaviest being terbium-171 (with atomic mass of 170.95330(86) u) and lightest being terbium-135 (exact mass unknown). The most stable synthetic radioisotopes of terbium are terbium-158, with a half-life of 180 years, and terbium-157, with a half-life of 71 years. All of the remaining radioactive isotopes have half-lives that are much less than a quarter of a year, and the majority of these have half-lives that are less than half a minute. The primary decay mode before the most abundant stable isotope, 159Tb, is electron capture, which results in production of gadolinium isotopes, and the primary mode after is beta minus decay, resulting in dysprosium isotopes. Later workers had difficulty in observing the minor colorless "erbia", but the soluble pink fraction was impossible to miss. Arguments went back and forth as to whether erbia even existed. In the confusion, the original names got reversed, and the exchange of names stuck, so that the pink fraction referred eventually to the solution containing erbium (which in solution, is pink). It is now thought that workers using double sodium or potassium sulfates to remove ceria from yttria inadvertently lost the terbium into the ceria-containing precipitate. What is now known as terbium was only about 1% of the original yttria, but that was sufficient to impart a yellowish color to the yttrium oxide. 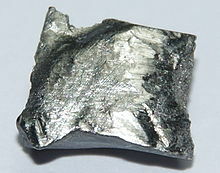 Thus, terbium was a minor component in the original fraction containing it, where it was dominated by its immediate neighbors, gadolinium and dysprosium. Terbium is contained along with other rare earth elements in many minerals, including monazite ((Ce,La,Th,Nd,Y)PO4 with up to 0.03% terbium), xenotime (YPO4) and euxenite ((Y,Ca,Er,La,Ce,U,Th)(Nb,Ta,Ti)2O6 with 1% or more terbium). The crust abundance of terbium is estimated as 1.2 mg/kg. No terbium-dominant mineral has yet been found. In 2018, a rich terbium supply was discovered off the coast of Japan's Minamitori Island, with the stated supply being "enough to meet the global demand for 420 years". 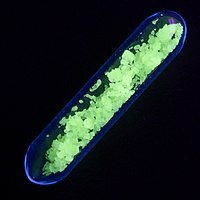 Terbium oxide is used in green phosphors in fluorescent lamps and color TV tubes. 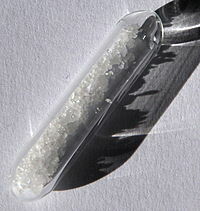 Sodium terbium borate is used in solid state devices. The brilliant fluorescence allows terbium to be used as a probe in biochemistry, where it somewhat resembles calcium in its behavior. Terbium "green" phosphors (which fluoresce a brilliant lemon-yellow) are combined with divalent europium blue phosphors and trivalent europium red phosphors to provide the trichromatic lighting technology which is by far the largest consumer of the world's terbium supply. Trichromatic lighting provides much higher light output for a given amount of electrical energy than does incandescent lighting. ^ a b c d e f g Hammond, C. R. (2005). "The Elements". In Lide, D. R. (ed.). CRC Handbook of Chemistry and Physics (86th ed.). Boca Raton (FL): CRC Press. ISBN 978-0-8493-0486-6. ^ "Rare-Earth Metal Long Term Air Exposure Test". Retrieved 2009-05-05. ^ Shimada, T.; Ohno, Y.; Okazaki, T.; et al. (2004). "Transport properties of C78, C90 and Dy@C82 fullerenes – nanopeapods by field effect transistors". Physica E: Low-dimensional Systems and Nanostructures. 21 (2–4): 1089–1092. Bibcode:2004PhyE...21.1089S. doi:10.1016/j.physe.2003.11.197. ^ Gruen, D.M. ; Koehler, W.C.; Katz, J.J. (April 1951). "Higher Oxides of the Lanthanide Elements: Terbium Dioxide". Journal of the American Chemical Society. 73 (4): 1475–1479. doi:10.1021/ja01148a020. ^ a b c d e Patnaik, Pradyot (2003). Handbook of Inorganic Chemical Compounds. McGraw-Hill. pp. 920–921. ISBN 978-0-07-049439-8. Retrieved 2009-06-06. ^ a b c d "Chemical reactions of Terbium". Webelements. Retrieved 2009-06-06. ^ Cotton (2007). Advanced inorganic chemistry (6th ed.). Wiley-India. p. 1128. ISBN 978-81-265-1338-3. ^ Rau, J. V.; Chilingarov, N. S.; Leskiv, M. S.; Sukhoverkhov', V. F.; Rossi Albertini, V.; Sidorov, L. N. (2001). "Transition and rare earth metal fluorides as thermal sources of atomic and molecular fluorine". ^ a b c d Audi, Georges; Wapstra, Aaldert Hendrik; Thibault, Catherine; Blachot, Jean & Bersillon, Olivier (2003). "The NUBASE evaluation of nuclear and decay properties" (PDF). Nuclear Physics A. 729 (1): 3–128. Bibcode:2003NuPhA.729....3A. CiteSeerX 10.1.1.692.8504. doi:10.1016/j.nuclphysa.2003.11.001. Archived from the original (PDF) on 2008-09-23. ^ a b Gupta, C. K.; Krishnamurthy, Nagaiyar (2004). Extractive metallurgy of rare earths. CRC Press. p. 5. ISBN 978-0-415-33340-5. ^ Rodriguez, C; Rodriguez, M.; Orue, I.; Vilas, J.; Barandiaran, J.; Gubieda, M.; Leon, L. (2009). "New elastomer–Terfenol-D magnetostrictive composites". Sensors and Actuators A: Physical. 149 (2): 251. doi:10.1016/j.sna.2008.11.026. ^ Rosen, D. L.; Sharpless, C.; McGown, L. B. (1997). "Bacterial Spore Detection and Determination by Use of Terbium Dipicolinate Photoluminescence". Analytical Chemistry. 69 (6): 1082–1085. doi:10.1021/ac960939w.